Tidal Trouble is the third level of Donkey Kong Country 3: Dixie Kong's Double Trouble! It is located in Lake Orangatanga, the game's first world. Similar to Lakeside Limbo, this level is set on another series of boardwalks, though this time there is a current in the water which can gradually sweep the Kongs away from the goal. They have to keep moving to proceed through the level because of it. 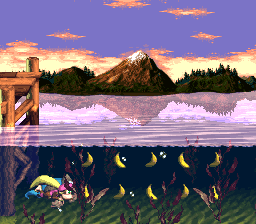 The strong current can also push the primates into enemies, so they must be careful. Enemies here include Kobble (SNES version only), Kocos, Knockas, Buzzes, Booty Birds, and Knik-Knaks. A Lurchin appears in a Bonus Level here as well. Dixie Kong and Kiddy Kong can also discover Enguarde in an Animal Barrel during the level. However, the swordfish is unable to swim far in the shallow water. This is the first level where the "B" on the Bonus Barrel swirls and dissolves. The Kongs begin the level under a small tunnel with a series of boardwalks ahead of it, which support a Koin. 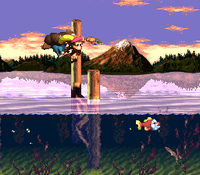 After passing the foe, climbing up a small ledge, and heading down a ramp, which contains a Kobble in the SNES version, the apes reach an area of water that they must swim through to reach a wooden platform held over the liquid. The letter K floats above the water, which contains a few bananas. Once they make their way onto the wooden platform, they can find a Bear Coin and a Buzz with a DK Barrel above it. As the primates travel ahead of here, they encounter a Koco in a long area of water. A thin, wooden structure stands in the water that they must hop over to move closer to a set of boardwalks that hold a pair of Knockas that are separated by a raised section of the platforms. An Animal Barrel that can turn the Kongs into Enguarde sits under the boards, and the letter O floats over the water after them. As the apes swim through the water, they encounter a few Kocos. They must maneuver over and under them to reach another set of boards that are supported over a pair of Kocos that block the way into a Bonus Barrel. After the primates travel across the flat boards, which carry a lone Knocka, they reach another area of water with a No Animal Sign in it. If they manage to pass a pair of Kocos and a thin, wooden structure in the liquid, they can reach a Star Barrel and a DK Barrel. Dixie jumps over a thin, wooden structure. Two buzzes follow the DK Barrel: The first Buzz hovers under a Bear Coin over the water, while the other hovers above a thin, wooden structure. Four more of these thin structures are ahead, and as the heroes travel over them, they come past a Buzz, found between the first two structures, and a Koco, who is located between the last two structures. A trail of bananas near here leads the Kongs under another Buzz and a Koco. A second Koco swims to the right of the foes, and it is followed by a pair of Knik-Knaks that float over the shallow water. They can be bounced on to reach a raised platform with a Knocka and a Booty Bird on it. The bird enemy can be defeated to gain the letter N. If the primates choose not to jump onto this platform, they can head under it, grabbing a hidden Bear Coin on the way. After they travel over or under the board, they approach a pair of Kocos that they must jump over to discover a thin and tall platform, which stands under a Bonus Barrel. They can find another pair of Kocos stacked on top of each other nearby, and these enemies are followed by an additional thin, wooden structure that is guarded by a Buzz that moves up and down. On the other side of the structure, the apes can find a DK Barrel and a banana trail that leads them under a Buzz and a Koco. Once they travel under these foes and dodge an additional Koco, they come towards another group containing a Buzz and a Koco, who are followed by the letter G, which floats over the rough water. A thin structure is ahead of here that the Kongs must jump through to reach a Koco and a set of boards that support a Knocka and a Level Flag. Kiddy Kong can be thrown at a crack in the ground immediately before the flag to reveal and opening with an Extra Life Balloon and a Barrel Cannon in it. K: The letter K floats above the first gap of water, which is located immediately before the first DK Barrel in the level. O: After passing the first two Knockas in the level, the primates swim through a water area with the letter O above it. N: On the small platform just before the second Bonus Level, the heroes can find a Booty Bird flying in the air. They are given the letter N if they defeat the bird enemy. G: The letter G hovers next to the final Buzz in the level, who is located above the water shortly before the Level Flag. Enguarde grabs stars in the stage's first Bonus Level. Shortly after the letter O, the heroes can find a pair of Kocos guarding the way to a Bonus Barrel. They should maneuver around these foes to reach it. The barrel is able to take them into a Bonus Level, where they need to collect thirty stars around the area with Enguarde, watching out for a Lurchin on the way. If they collect all of the stars in less than 20 seconds, a Bonus Coin appears at the right end of the stage. After the Star Barrel, the heroes can find two Knik-Knaks floating in the air. They should bounce on these foes to reach a high boardwalk. There, Kiddy needs to take the lead and roll towards the water. As he hits the surface of the liquid, the player needs to hit the jump button, making him bounce on the water. Bouncing on the water a few times sends the young ape onto a small platform with the Bonus Barrel above it. If Kiddy is to miss this platform, he is forced to restart the level to reach the area, as he and Dixie are unable to reach the high boardwalks again. Once Kiddy jumps into the barrel, he is taken to a Bonus Level. There, Kiddy and Dixie have to move along a tightrope and defeat some Knik-Knaks within 20 seconds. A Bonus Coin appears at the end of the stage once all of the enemies are defeated within the time limit. Dixie Kong can simply use her Helicopter Spin ability to reach the second Bonus Barrel in the Game Boy Advance version. Either Kong can also simply jump to the platform to reach it in the same version. It is also possible to reach the barrel with Dixie's Helicopter Spin in the SNES version if Dixie jumps from the previous platform as close to the edge as possible and starts her Helicopter Spin at the right time. At the beginning of the level, the Kongs meet a Koin, who is in possession of the level's DK Coin. He will not give up the coin without a fight, and his shield can protect him from most of the Kongs' attacks. Therefore, the apes need to retrieve the Steel Keg hidden on top of the entrance by using their Team-up move and then stand on the enemy, causing the Koin to put its attention on the primates. If they are to throw the barrel at the nearest wall at this time, it will bounce off of it and hit the Koin in the side. This is able to defeat it, thus giving the Kongs the DK Coin. After passing the level's first Koco, the Kongs should, not jump over, but land on, a very skinny platform, hardly big enough to hold both of them. Kiddy must then throw Dixie north-west to reach the hidden Warp Barrel, which sends them to the Level Flag when entered. Dixie jumps towards the letter O in the original version of the game. The Kongs stand under a Bonus Barrel. Kiddy reaches the letter K in the Game Boy Advance version of the level. The primates approach a DK Barrel located underwater.